A disaster can put your home and your daily routine in a frenzy for anywhere from a few hours to a few weeks... the good news is there is a light at the end of the process. SERVPRO goes the extra step to make sure your home is back to normal, if not better, as fast as we can. We offer rebuilding services if a fire or any other disaster left your home in disorder. Big or small Commercial Companies call SERVPRO to come and do the cleanup and repair after the source and issue has been resolved. Sometime flames and cinders pop into places that only the experts can find to make sure the necessary repairs are done to prevent any further or future issues. Our specialized technicians are specially trained to re-mediate the mold that can grow in the duct-work and insulation of your home. We will search it out and get rid of it be it in the attic or in a crawl space! If you think you smell or see mold in your home call SERVPRO to come take a look and get the answers you are looking for. Sometimes "Hoarding" can be a subjective opinion, other times the situation is quite obvious. The concerns go beyond health and sanitation to those of safety in the event of a fire or an emergency; particularly if the alternative pathways for egress are blocked. The county even steps in when conditions have been so obvious neighbors or relatives notified the authorities. Standing Water on the floor can result in a mold issue in your sub-flooring. The material of your floor and the amount of time the water saturated the area is what determines the issue. Get SERVPRO on site ASAP to dry the structure properly and reduce the odds that you will have to deal with Mold. If you live in the northern section of the country you may have experienced an ice storm. Although beautiful to the eye the resulting damage is usually catastrophic. The weight of the ice downs power lines and everything freezes in the absence of heat. If you are at risk...have a back up plan. Water sprinklers are installed for your safety and there ti help in the event of a g fire. Numerous sprinklers are accidentally set off resulting in water spraying out as designed to do. Take a mental note of where your sprinklers are and be careful not to hit them accidentally... or SERVPRO will be there to get the water up! It is unfortunate but the convenience of your refrigerator water supply line operating incorrectly is a common cause of water loss for us to deal with. If you live above another unit or have a basement this can mean damage for other residents and the added expenses. If you have concerns about either damage or restoration to your wood or laminate floors; let your worries subside by calling us to come and Clean, or Fix, or Replace your flooring. 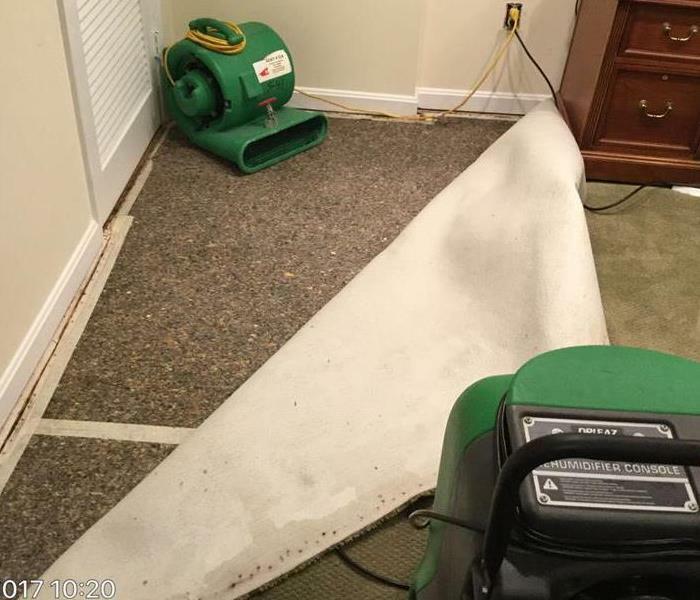 Water and time are your enemies, SERVPRO is your "Go to" Company no matter what the flooring surface is. No job too big and no job too small. 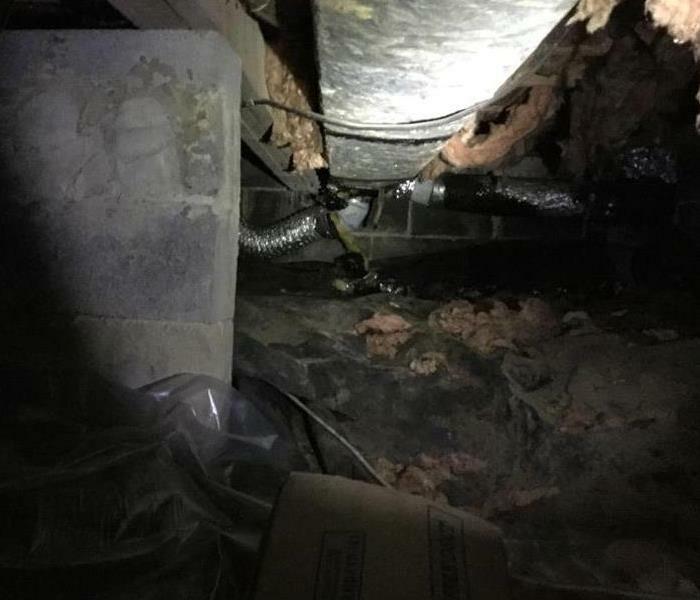 Crawlspaces can be tight, damp, cold ... and outside the reach of most electrical plugs and power sources. 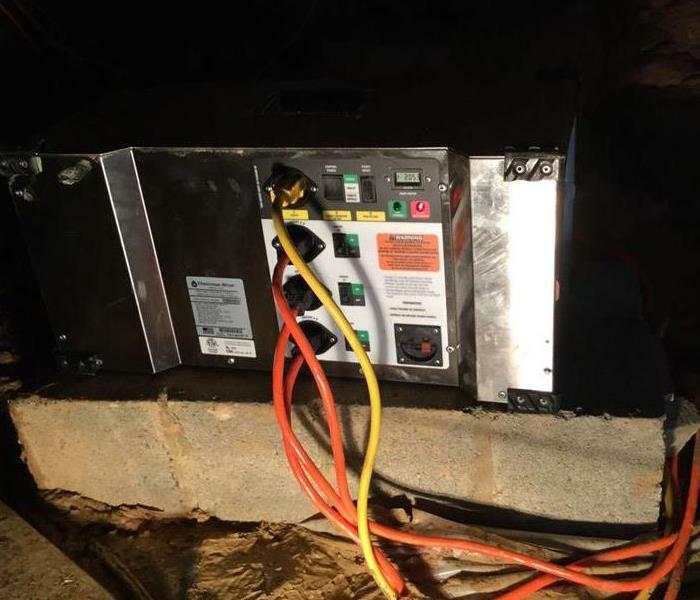 We have portable Heat Drying Systems we bring for just that reason; so we can accomplish the fastest structural drying available. We don't just do the job, we do it right! We have a variety of packing and storage materials just around the corner in our Warehouse; to ensure that every item our customers has will always be properly handled and stored. 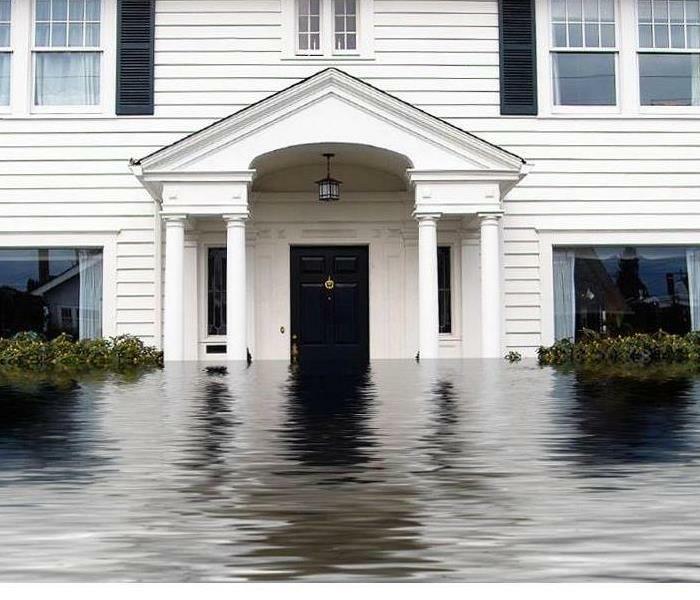 SERVPRO stay on call to always be of assistance if a hurricane brings flooding conditions or if there is a flood that results from any other numerous weather conditions. Remember "Safety First" for both yourself and for those responding to help. When storms roll in and bring the strong winds and heavy rains, there is a stronger risk of damage to the roof. Damage to the roof will almost guarantee damage to the structure and the ceilings if the rain is still coming down. If your house is hit with Lightening it can result in a fire in the home as well as shorting out electrical devices that might be plugged in. These fires can even travel into the ceilings. A safety check with your local fire department could give you tips to prevent an electrical fire due to a storm in your home. The severe weather here caused pipes to freeze and break inside of the building. Upon arrival to the building the Crews spotted the frozen areas and ice on the sidewalk outside which alerted them to the severity of the situation inside. Many house fires are preventable. Human error can be minimized if we can be more diligent regarding safety issues. Indoors or Outdoors SERVPRO is there to help and do Clean up when you have a situation where you need clean up and debris from a fire removed. Cleaning debris after any type of loss can be critical to expediting the drying and rebuilding process. Certain standards have to be met in order to proceed from one level of the process to the next. There is no cutting corners! Pipes are generally in the ceiling throughout all buildings both commercial and residential. It is always a smart idea to know where the main water valve shut off is, so you can minimize damage once you are aware there is a broken pipe issue. Fire in the kitchens are more common then we might want to think. Hopefully it is caught early on and the clean up is not very complicated, but if it burns long and hard enough it will mean gutting the room and rebuilding from scratch. Yep...we do both. Just because you think an area is dry does not mean it is in fact dry. Our Technicians and Commercial Drying Specialists monitor each job daily so we know when the process is complete. The slightest bit of residual moisture can cause severe problems especially over time. After a catastrophe businesses as well as residences can take the opportunity to update the affected area if it were necessary to tear it out due to damage sustained. We have a rebuild division that can help you rework your design and install. An air scrubber is a portable filtration system that removes particles, gasses, and/or chemicals from the air within a given area. The machine draws air in from the surrounding environment and passes it through a series of filters to remove contaminants. HEPA filters must be used to make it effective for mold spores. Moisture is a major contributing factor to the development and growth of mold, so it is not a big surprise to find mold growing in a room as humid as the bathroom. Remediation of mold is not always a complicated process but the earlier you catch the situation and take care of it odds are the remediation will be much much easier. Numerous circumstances in the home can cause condensation. 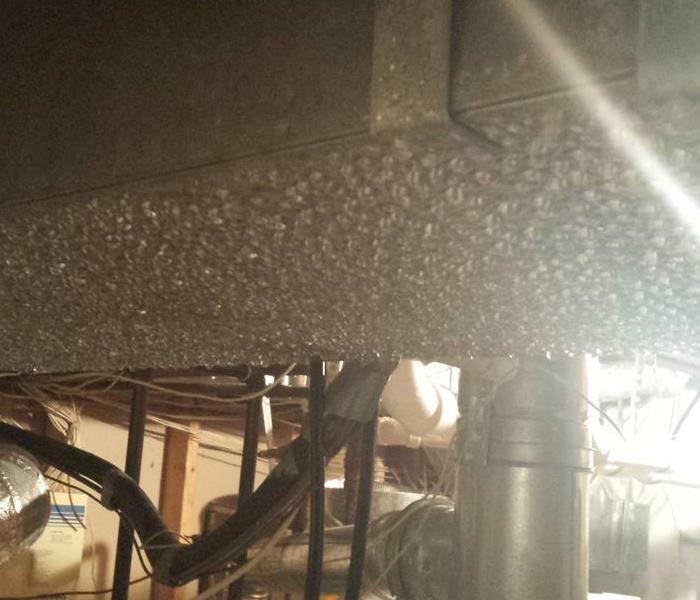 When the condensation gets extreme and is clearly visible on the HVAC system and air vents then it is time to get the moisture out of the air! Depending on the cause of the moisture SERVPRO has a range of equipment to dry out and re-stabilize the room and air conditions to prevent mold from starting. After the water loss source is located and fixed, the water is mitigated from the site of damage, the drying process is started and monitored until dry and finally the area is cleaned and sanitized. Upon completion of the sanitation unless rebuild is needed our work is completed and ready for you to go about your normal daily business. When the local Fire Station had an unexpected fire they called on SERVPRO to come and do what we do best. Fortunately it was not a large fire and damage was minimized, even then the clean-up has to be done correctly. The Pros know where to go for Professional Service. A severe mold condition can start with something as simple a a drip from a pipe that is trapped in the walls between the drywall. 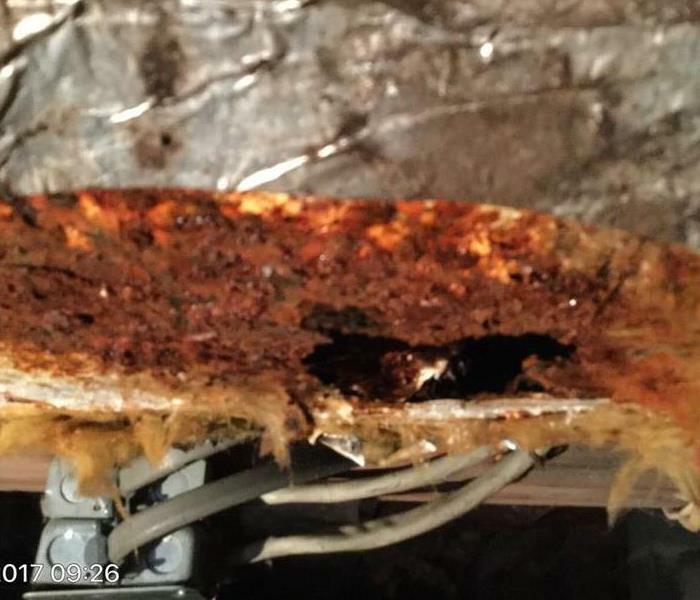 This drip can go unnoticed for months to sometimes years and the smell of the mold, or the mold starting to grow on the drywall will be the tell tale sign. Our Technicians each undergo extensive water and restoration training. We have mold and fire specialists to cover any and all of your emergency needs. SERVPRO stays up to date with the latest advances in technology to best meet industry standards and ensure customer satisfaction. Our equipment and vehicles are cleaned, logged and Inspected on a routine basis, to ensure they are ready when we need them to service our customers. 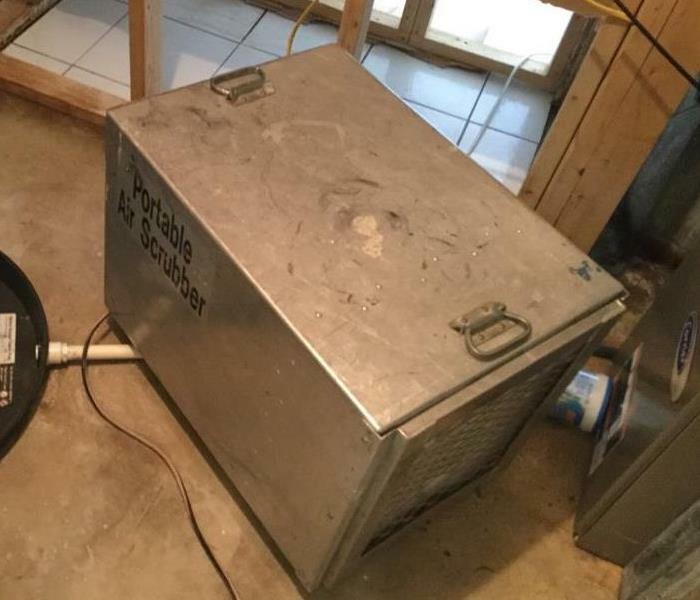 We have the proper Drying and Air Purifying Equipment to get the toughest of jobs done and odors removed. 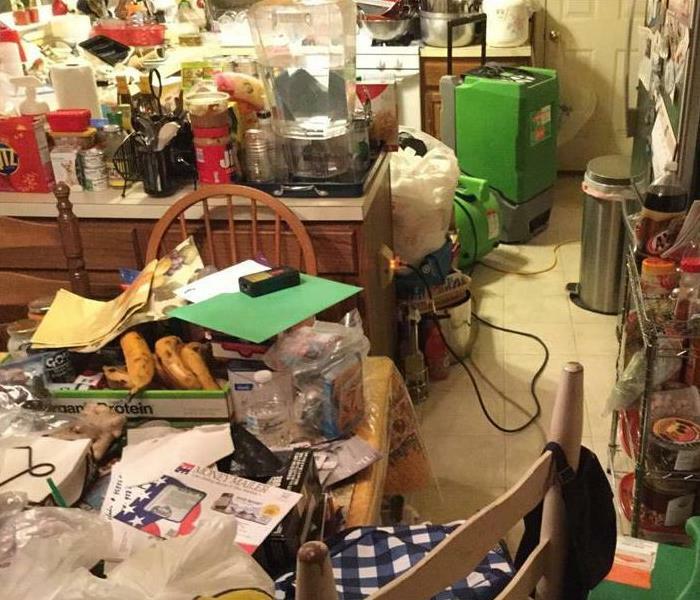 The owners’ family contracted with SERVPRO of Reston/ Herndon to clean what was an extreme case of hoarding and animal defecation. The cleanup required removal of all the carpet, pad, and vinyl flooring; deodorizing and sealing the subfloor; removal and disposal of all the upholstered furniture along with the replacement of stained and smelling kitchen and bath cabinets and base trim. After the cleanup and renovation the home is brand- new! Each member of our Staff is cross trained in at least two different positions to make sure that we are always covered to help our customers 24 / 7. Disasters can happen at the most inconvenient times. We know you need action, and we are ready to help. We take pride in the Services we bring to our customers and do our best for 100% Satisfaction. Help is always just a phone call away with SERVPRO, and no job is too big or too small. Call with any questions and let us do our best to help you.